For connection of three 3-Pin fans (radiator fans, case fans etc.) 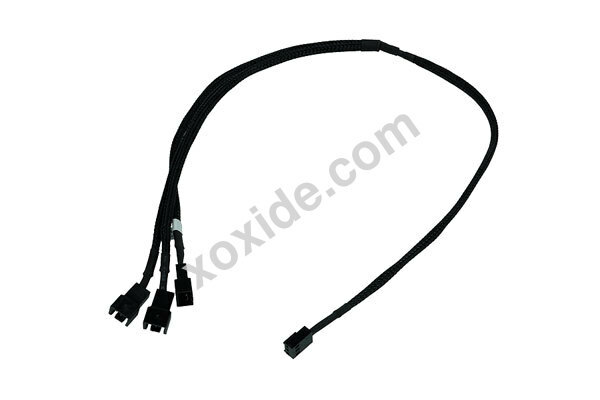 to one Mainboard connector (3-Pin). Please note that rpm monitoring is possible for only of the connected fans. Phobya's goal is to make the work of professional and hobby modders a bit easier with these cables. Sleeving is a lot of work and requires much time. But with these cables by Phobya the whole system can be redesigned any way you like by simply adding these cables. A white sticker on one of the cables shows which fan can be monitored. Please note: When using this adaptor cable please always consider the limitations of the socket from which it draws power. To high currents and loads caused by the connected fans may damage the connected devices!